AP Transactions can be memorized as transaction templates to be used again in the future. 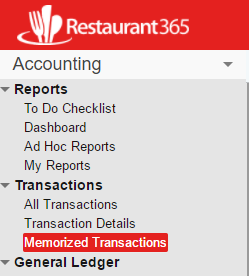 In addition to creating a transaction template, Memorized Transactions can be scheduled and automatically created. To begin, create an AP Transaction that will be memorized and saved as a template. Enter all the details in to the AP Transaction. Certain values, such as the Invoice Number, will vary with each use. When a Memorized Transaction template is used, it will be created with a status of Unapproved. The necessary updates can be made before the transaction is Approved. Note: Once a Transaction has been Memorized, a real Unapproved Transaction with the containing data will also be created. If the Memorized Transaction is solely for future use as a Template, ensure to delete the Unapproved Transaction that was just created. As a best practice, enter a value such as 'FoodVendor_template' as the Invoice Number to offer a reminder that the Invoice Number needs to be updated with each use. 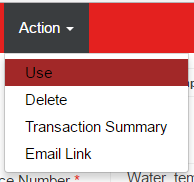 Once the transaction is complete, hover over 'Action' and select ‘Memorize’. This action will save the current AP Transaction and open the Memorize prompt. 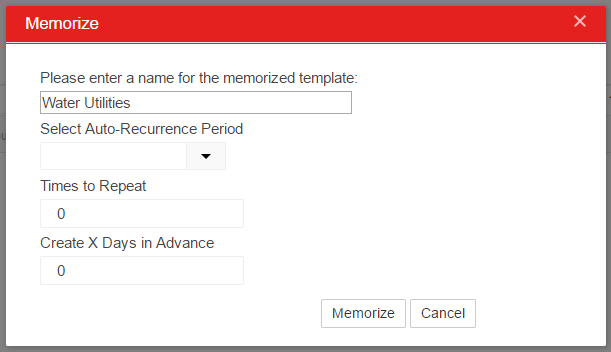 Select Auto-Recurrence Period - specify if this is a Scheduled Memorized Transaction where the system will automatically create this transaction based on the schedule selected. Note: A transaction that has a set recurrence will create an Approved transaction when the recurrence period arrives. Even if the transaction is saved/memorized in an unapproved state, the recurrence-generate transaction will be generated in an Approved state. Times to Repeat - enter the desired number to recurrences. For example, Weekly * 52 = 1 year. Every 2 Weeks * 52 = 2 years etc. Days in Advance - specify how many days in advance the transaction will be created. For example, if the recurrence was set to have the transaction created on the 15th of each month, and the Days in Advance value was 2, the transaction would be created on the 13th with a date of the 15th. 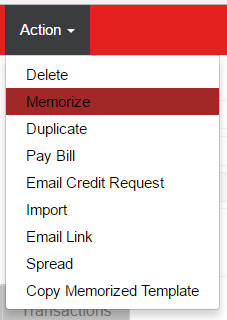 Click 'Memorize' to save the Memorized Transaction. A system alert will notify the user that the template was created successfully.